A quick-guide to Lisbon has been very requested by friends in Amsterdam. A good friend of mine just booked a 3 day-trip to Lisbon and I promised him a 3-day quick-guide with the musts, by neighbourhood. Designing a tour of Lisbon is like a dive in my past and in some of my wildest and more beautiful memories. It’s like digging old books about adolescence and young adulthood with all its hopes, fires, falls and adventures. I was happy to do it, thus. This is not an extensive guide but everything is doable and should keep one busy for this short-stay while making sure to properly explore the core of Lisbon. You can find basic info on food/drinks plus a few suggestions of places where to feed yourself by the end of the article. 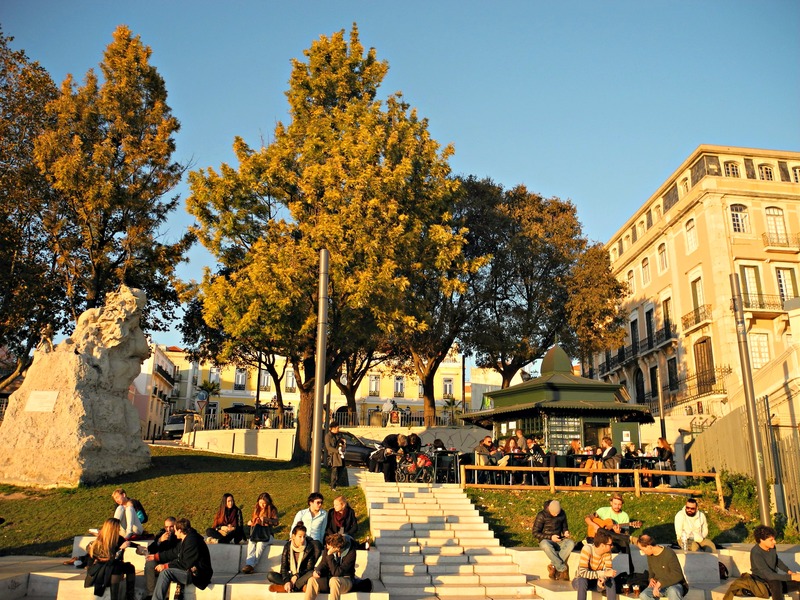 + Praça Marquês do Pombal is a good starting point for your trip. You get to see the statue of the prime minister of King Dom José I, who was responsible for the reconstruction of the city of Lisbon after the earthquake of 1755, an event that led to the destruction of the city almost in its entirety. Walk from there along Avenida da Liberdade, the fancy shopping street, down to Rossio. + If you want to be at Miradouro de São Pedro de Alcântara in the blink of an eye (the breathtaking viewpoint over Lisbon), know that you can take the Elevador da Glória (Gloria’s lift) and go explore the neighbourhoods of Príncipe Real, Bairro Alto and Chiado. In that case, jump to those sections of the article. It is also good to know that this lift is included in the 24-hour public transportation card for Lisbon, which is only worthy if you are short on time and plan to visit a lot of different places on the same day. Otherwise, walk the city. I’m serious: don’t think of the hills, just walk. It’s the way to really explore Lisbon. + This iconic square has been a meeting point for Lisbonners since centuries, with all its cafes and typical shops, including the Ginginha place at Largo de S. Domingos 8, where you can try the city’s typical sour cherry liquor. Admire Rossio’s train station, a neo-Manueline monument from the XIX century, and the national theatre, Teatro Dona Maria II, standing on the other side of it. The theatre dates back to the 1840’s and it is the crown of the square. There’s a lovely place I’d recommend you to eat at called Casa do Alentejo. This is a local gem located at Rua das Portas de Santo Antão 58, where you can also find a number of cultural venues, and another ginginha shop, amongst all the touristy restaurants and souvenir shops. + Once at Baixa, Lisbon’s downtown, one idea is to take up the Santa Justa lift and visit the amazing Carmo area. If you have purchased a 24-hour public transport ticket you can take the lift for free. If you do not have such a ticket, or don’t want to waste your time standing in line, skip it and just walk Rua do Carmo up to Armazéns do Chiado (a renowned shopping centre), take a right turn to Calçada do Sacramento and walk up until you reach the lovely Largo do Carmo, where the lift would bring you. On your way there, you can stop at Santini ice-cream shop ( R. do Carmo 9) – a big favourite of locals – to gather courage. At Largo do Carmo you can visit the archaeological museum housed inside of the ruins of the gothic Convento do Carmo, a convent that dates back to 1389 and partially survived the 1755 earthquake. From there you can walk directly into Bairro Alto or – what I would do – go contemplate the city from above first, at Miradouro de São Pedro de Alcântara, one of the most beautiful viewpoints in the city. Then you can do Bairro Alto (I’ll write about it further on in the article). + The so-called Baixa Pombalina was built after a grid pattern, a rectilinear organization that contrasts with the rest of the city. All the buildings follow the same typology, four floors max, a shop on the ground floor, in an elegant and sober neoclassical style. Go for a stroll along Rua Augusta unless you’re crowd sensitive. In that case, choose any of the adjacent streets, they’re all lovely, hence the tourists. The important thing is that you go in the direction of Praça do Comércio and admire the Rua Augusta Arch, a triumphal monument that is intended to commemorate the city’s reconstruction after the earthquake. The arch connects the downtown with the square (praça) which, in its turn, feels like the gateway of Lisbon. MUDE – the Museum of Fashion and Design, at Rua Augusta 24, is also very worth a visit. + This spectacular square now named after Praça do Comércio (Commercial Square) was the site where the royal palace was once standing (pre-earthquake), hence the old name Terreiro do Paço. It’s rectangular shape, the spaciousness, the canary yellow facades, the mosaic cobblestones, the arcades crowned by the Rua Augusta Arch, the equestrian statue of the king Dom José I, the Tejo waterfront and its quay, where the ships would disembark in the old days, all this makes for my favorite square in the world. There are two things I haven’t done here yet but you should: 1) climb to the top of the Arch and have a panoramic view of the city; 2) visit the Lisbon Story Centre, an interactive museum on the history of the city. Afterwards, you should do one of two things: whether take the tram to the Belém district (right on the square), whether walk along Avenida Ribeira das Naus, which is to say, along the river in the direction of Cais do Sodré. + While at Baixa / Praca do Comércio you can also walk to Lisbon’s Sé Catedral, a magnificent cathedral of which construction dates back to the 12th century when the first Portuguese king Dom Afonso Henriques conquered the area from the Muslims. It exhibits a mixture of Romanesque, Gothic and Baroque elements. + Belém is a delightful Lisbon’s district which combines the best of all worlds: culture, parks, the Tejo river, food and… space. Most of the monuments here are reminders of the Portuguese discoveries. Such is the case in Padrão dos Descobrimentos, Torre de Belém, and Mosteiro dos Jerónimos. Lines for the aforementioned can be overwhelming but you should at least visit the church of the Jerónimos Monastery which is free entrance. The construction of this Gothic Manueline complex was financed by the wealth of the trade with Africa and the Orient in the XVI century and it was considered a World Heritage Site by UNESCO, together with Torre de Belém, which is originally a fortified tower intended for city protection. Padrão dos Descobrimentos (Discoveries Monument), located in the edge of the Tejo, honours the Portuguese explorers from the Portuguese Golden Age and it has an inscription that reads “To the Infante Dom Henrique and the Portuguese that discovered the roads of the sea”. + Now, one thing I wouldn’t miss (unless you’re absolutely short on time) is visiting the CCB (Belém Cultural Center) and its gardens, including Museu Berardo, the contemporary art museum inside of CCB which has no entry fee. What can also be nice is a stroll around Jardim Botânico Tropical (the Tropical Botanical Garden), located next to Mosteiro dos Jerónimos. Another Belém classic is a visit to Pastéis de Belém for you to stuff your face in custard tarts. When I was a kid this was an excursion our family would regularly embark on but back in the day, there were hardly no tourists in Lisbon. Although I usually don’t sacrifice my time if the crowd is too pushy, sweaty, and ravenous, one might get lucky. + Jardim do Princípe Real is a lovely park with a restaurant, a quiosque and trees as old as your grand-grandparents. You can go visit Embaixada nearby, a palace from the XIX century turned into a hyped shopping gallery. Afterwards, I’d walk down to the picturesque square Praça das Flores, where you can sit and have a drink. If you’re a sucker for specialty coffee like me you can drop by Copenhagen Coffee Lab and get your fix of coffee + wi-fi (in case you’re not yet shaking from all the Portuguese espressos which should, of course, be the priority). This will be on your way to Palácio de São Bento, the Portuguese Parliament. It is worthy to go contemplate this neo-classical building and the beautiful area where it stands and, if you feel courageous, go on and climb up the hilly street that leads you to Jardim da Estrela, another garden where a number of cultural activities are regularly organized. If you’re into gay and lesbian nightlife, go back to the Príncipe Real area later in the evening and you’ll be home. + From Jardim do Príncipe Real you’re really close to Miradouro de São Pedro de Alcântara, the viewpoint I told you about previously, and of Bairro Alto. + Bairro Alto got famous for its nightlife and for being a hub for counterculture back in the end of the 80’s and the 90’s. I used to meet my friends at Largo Camões, next to the statue of the Portuguese poet and then we’d head up. I must say that, nowadays, I prefer to visit Bairro Alto during the day, while it’s calm and you can still catch a glimpse of local life. Since around five years it has become too touristy and crowded and most locals have moved to other areas of the city. 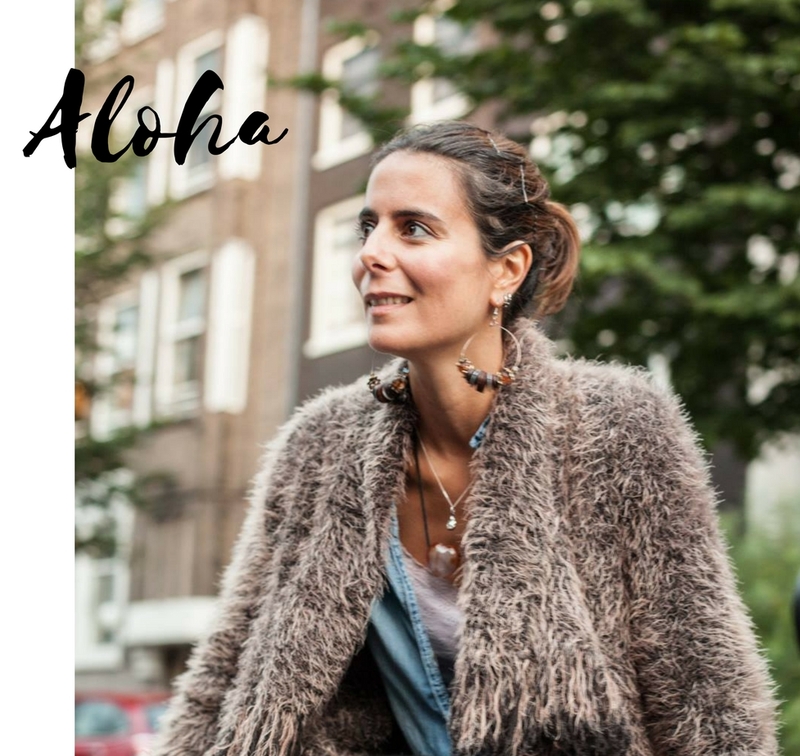 I’m sure you can still find some good gems to hang out – I used to love “Loucos e Sonhadores” at Rua da Rosa 261, a calm cute cosy place where to have a conversation and listen to good music. A brilliant gay-friendly place to dance at was “Purex” at Rua das Salgadeiras 28, and for some proper rock, you had “Indie-Rock” at Travessa dos Inglesinhos 49. + Rua da Bica, with the Ascensor da Bica (the traditional yellow lift) going up and down, is still a good area to hang out. I like to arrive at the end of the afternoon, have dinner in the area (try “Toma lá dá cá’) and then head to the next stop. Do it as the locals do and crawl from bar to bar until you get to Cais do Sodré. For some late night dancing, you might want to try “Lounge” at Rua da Moeda 1 or “Incógnito” at Rua Poiais de São Bento 37. + What you can’t absolutely miss is Adamastor, the viewpoint of which real name is Miradouro de Santa Catarina. “Adamastor” is depicted in the sculpture standing next to the quiosque, and he’s a mythical creature from Camões most famous epic work “Os Lusíadas” (1572), a symbol of the dangers posed by sea during the Portuguese discoveries. 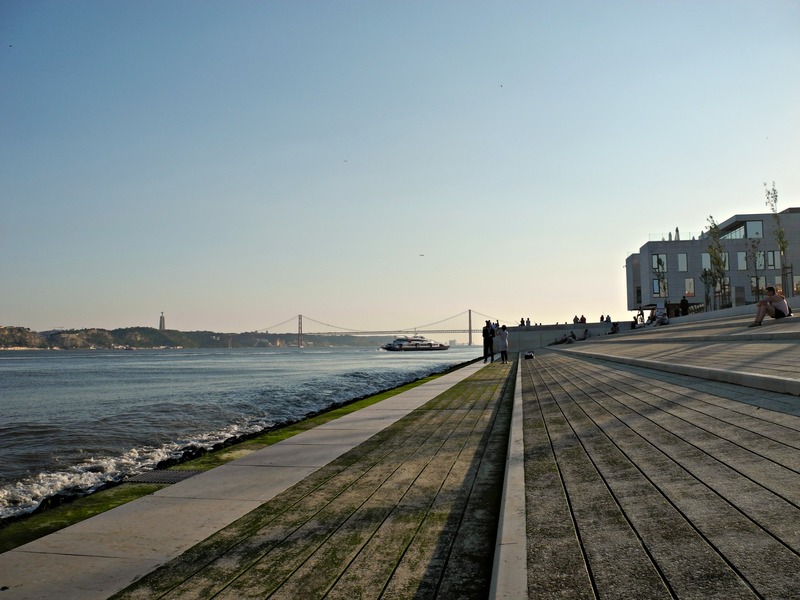 This is a hangout place with a very young and relaxed vibe, from where you see the Tejo, the Cristo-Rei monument, and the 25th April bridge that connects Lisbon to Almada. Back in the day, we used to buy beers at the supermarket and go drink them there as we chatted the afternoon away and watched the sunset. I was pleasantly surprised to see, last time I was in Lisbon, that this still happens. + Here we are again. 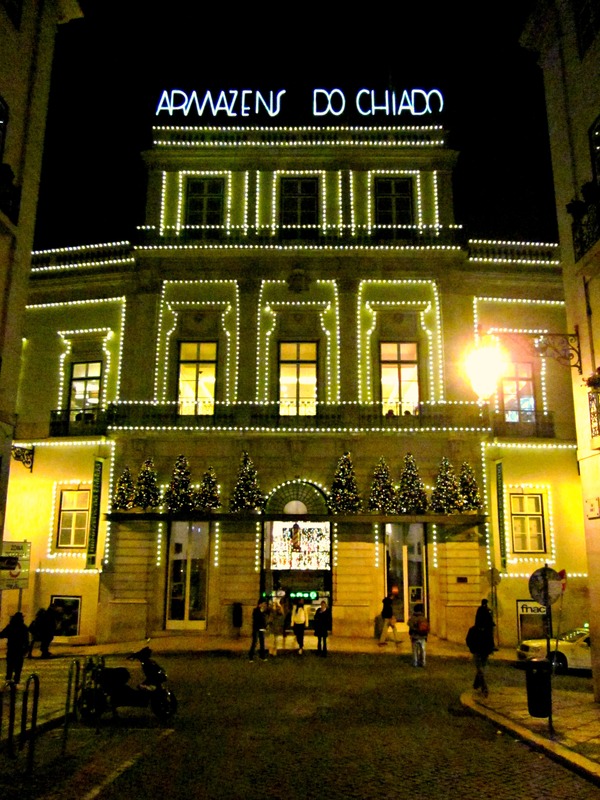 Remember Armazéns do Chiado? That’s also a traditional meeting point in Lisbon. If instead of going in the direction of Carmo, you walk up Rua Garrett, you’ll be surrounded by buildings from the 18th century, in a buzzing and charming shopping area. Once you get to the stunning Largo do Chiado you can find, at your right-hand side, café “A Brasileira” of which the writer and poet Fernando Pessoa used to be a regular (he’s still there, carved in stone). I used to go to “Benard”, the cafe next door, for a chocolate croissant. + When I was 18 I couldn’t tell my parents I was going to Cais do Sodré. It was still a dingy, dirty area (at least in the eyes of most people), with no pavement in pink. It was mostly go-go bars, prostitutes, drug addicts and dodgy fellows. There were also a number of pretty underground venues like Music Box, Jamaica or Europa, and their crowd. We would usually arrive there around 3 / 4 a.m. after Bairro Alto closed, to dance the rest of the night away. In 2011 everything changed, and Cais do Sodré became trendy. + The Berlin style “Pensão Amor” is a cute place to visit and have a drink at, and “Sol e Pesca” used to be good for drinks and snacks. Praça de São Paulo and its quiosque are great for a drink outside as well (make it a ginginha). But if you want to dive into Portuguese gastronomy make sure to visit the Time Out Market at Mercado da Ribeira. Foodwise, you’ll find samples of everything there, from traditional to more contemporary options, including drinks, cakes and snacks. + Getting to Castelo de São Jorge (St. George Castel) with the tram number 28 is an unmissable experience. However, everyone seems to agree with this statement and trams are narrow, so get ready for the big squeeze. This truly vintage tram is an original from the thirties! Try to catch the tram very very early in the morning, or right after 9 am (when most people are already at work), during Portuguese lunchtime – 12.30 to 14.30 -, or from dinner time on – 20.00. Or honestly, whenever works. This used to be my daily commute to work when I lived up at Graça, and, despite how busy it already was, also delightful every time. 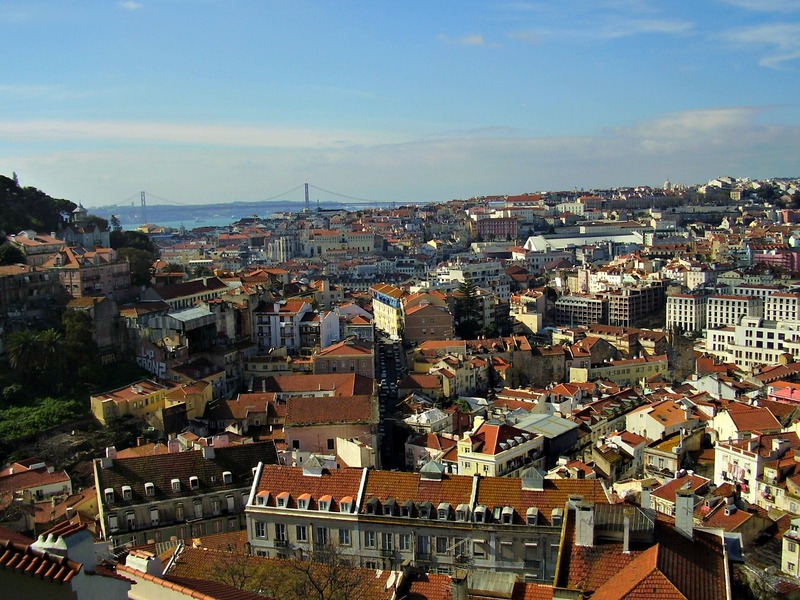 You will get out at Miradouro de Santa Luzia, which offers you a wonderful view over Lisbon. + Chapitô at Costa do Castelo 1 is a cultural centre that hosts a circus school, a bar and restaurant. It is good for drinks, food, a show, a bit of dancing and a breathtaking view. + Miradouro das Portas do Sol is another of those F A B U L O U S viewpoints in Lisbon. You can do it after visiting the castle. Afterwards head down to Alfama. + Alfama is the home of Fado, the music genre which “makes the cobblestones cry”, or as we say in Portuguese: “faz chorar as pedras da caçalda”. I used to warn people that it might be that fado is too intense for them – go and listen to traditional fado and you’ll understand why. Now that people, in general, are more acquainted with the Portuguese culture, in general, I feel that – generally-, they tend to be more able to withstand it, but I still find the warning a valid one. In general. So my general advice is that you try a casa de fado, and go have your meal while you listen to it. Oh, and in case this paragraph was generally confusing as to where I stand regarding Fado, I’ll be clear: I do love it. That’s why I also think a good idea for you to go visit the Fado Museum. Generally speaking. + Suggestions for casas de fado: see the end of the article. + This is the neighboorhood where I have left my Portuguese heart. Feira da Ladra, the flea market, is where I used to go hunt for treasures – and sell! -; Miradouro da Graça is where I used to meet up with friends, Miradouro de Nossa Senhora do Monte is where I would go breath fresh air when the world around felt heavier. How many “viewpoints” can Lisbon have? According to this article, they might be thirty, but you never know. + Next to Feira da Ladra – that works on Tuesdays and Saturdays -, you have Panteão Nacional, the former Igreja de Santa Engrácia. This 17th-century church / National Pantheon is a must, I believe. Panteão Nacional is the monument where most of the eminent Portuguese historic figures are buried. After exploring the numerous options Bairro Alto, Bica and Cais do Sodré neighbourhoods have to offer, you can take a taxi to Lux, the emblematic club of Lisbon (a shared ride shouldn’t be expensive). Pastéis de Nata – The most famous of these are Pastéis de Belém, of which recipe is secret, but the regular pastéis de nada sold at regular cafés are great as well. Coffee – Coffee is the national sport and you should drink it as a local: one bica – expresso – with pastel de nata. Super Bock or Sagres – The national beers. Portuguese people are divided into the ones that only drink one of them and the ones who absolutely prefer the other. I am team Super Bock. Portuguese wine – We are massive producers of excellent wine. Winoogal could be our nickname. Fish! 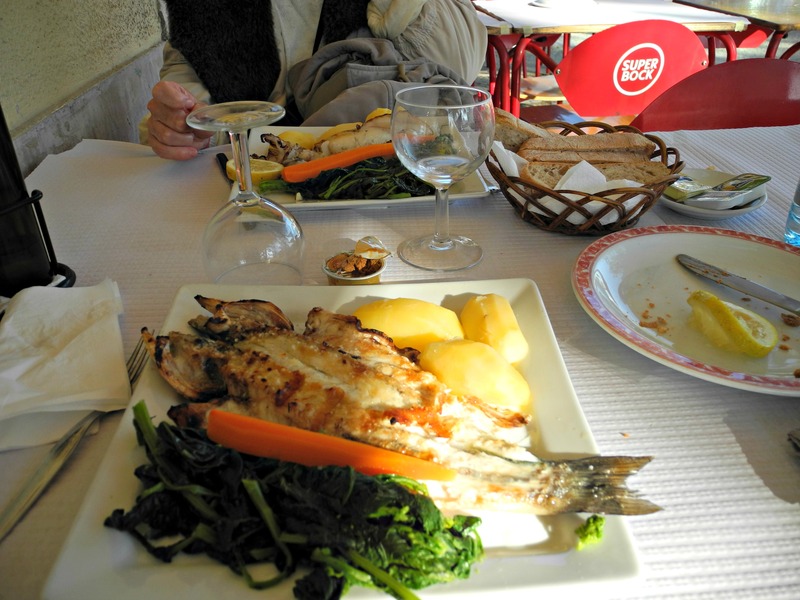 – Go to a restaurant and have a proper fresh grilled fish meal. I personally love seabass or snook, but if it’s June or July you HAVE to try sardines or horse mackerel. If you want to eat like a native have a vegetable soup first, and stuff yourself with some bread, cheese and olives as starters. Bifana no pão – In case you eat meat, you should try this Portuguese snack, ideally in a crappy looking restaurant or snack-bar: a piece of meat inside of a bread and you can’t go more native than this. GOLDEN TIP #1: Lisbon Lux do this much better than I do. Go read their website. GOLDEN TIP #3: Are you really into this? Here’s a personal story: “Lisbon whispered in my ear“. Enjoy!